Once your pet has an accident on your carpet, it is more likely that the incident will be the first of many. While your pet might have medical or aging issues that make it difficult to hold their urine and feces, the cleanup is one that most homeowners would want to miss. In addition to getting the stain out, homeowners must deal with pet odor removal, a task that sounds easier than it really is. If you live in the Gainesville area, please consider giving our stain and odor specialists a call. We’ll be glad to help, but in the meantime, here are a few tips to get you started on your own. For urine stains, soak up as much of the liquid as possible right away using rags or paper towels. For accidents involving feces, remove as much of the solids as you can before soaking up any accompanying liquid. Always attend to pet accidents as soon as possible to minimize the risk of creating a permanent stain. Arrange for a cleaning company to come in and clean your carpets as soon as you can. The longer the stain is allowed to sit, the more difficult it becomes to get rid of it. 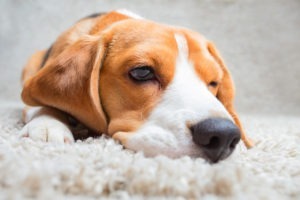 Unfortunately, pet odor removal is more involved than simply eliminating the stain from the carpeting. A special enzyme-containing solution must be used to eliminate the strong odors caused by urination or defecation. If the wrong type of cleaner is applied to the stain, the odor often becomes permanently ingrained in the fabric. Pre-treat the stain with the enzyme-containing solution and avoid using heated water because that will only set the stain.